redBus displays a series of 5 star hotels in Guindy, Chennai at modified prices. We have a diversified range of 5 star luxury hotels in all corners of Chennai, ensuring comfort and quality throughout your stay. It consists of some of the renowned hotels that offer convenient accommodation with round-the-clock facilities and amenities available along with comfortable different check-out and check-in timings in Guindy. 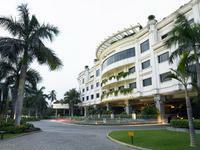 Now you can relax and explore Guindy in any luxury 5 star hotel and make your trip noteworthy.